Park Avenue Armory is located at 643 Park Avenue between 66th and 67th Streets. For individuals requiring assisted access, a sidewalk-level entrance is available at 103 East 66th Street, located just east of Park Avenue. Patrons may ring the service bell when they arrive, or make arrangements prior to arrival by calling the main security desk at (212) 616-3950 extension 1. *Proof of membership and ticket stub is required for all above restaurant offers. The Armory is open to the general public during public hours of Armory Programming. To schedule a tour of our magnificent historic spaces, please click here. TO GET HERE BY SUBWAY: You can reach Park Avenue Armory on the 6 train at 68th Street/Hunter College or the F or Q trains at 63rd Street/Lexington Avenue. TO GET HERE BY BUS: You can take the M101, M102, or M103 (limited and local) to 68th Street and Lexington Avenue; M66 to Lexington Avenue and 67th Street (Westbound) or Madison Avenue and 68th Street (Eastbound). 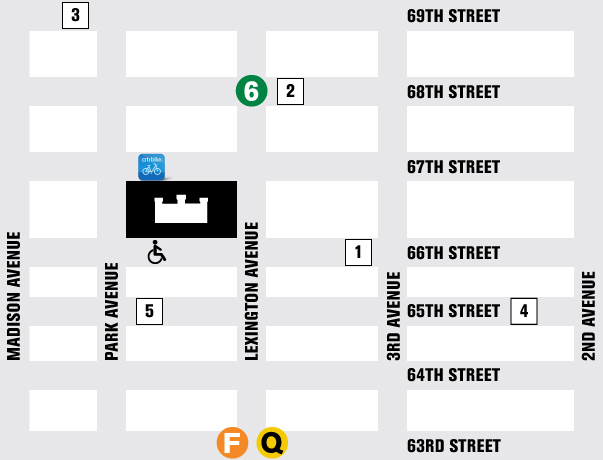 TO GET HERE BY CITI BIKE: A Citi Bike docking station is located at the corner of 67th Street and Park Avenue.